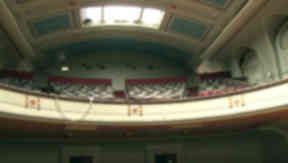 The main auditorium of Leith Theatre fell into disrepair after it closed in 1988. A derelict concert hall that once played host to some of the most famour rock bands is to re-open. The main auditorium of Leith Theatre fell into disrepair after it closed in 1988 but now fundraising is under way to restore and preserve the building. It was built as a concession from Edinburgh Council to the people of Leith when the two were merged against residents’ wishes in 1920. During World War II it was badly damaged by German bombs but survived and in the 1970s played host to bands such as the Rolling Stones, The Kinks, Thin Lizzy and AC/DC. However, more than 20 years after it closed, Leith Theatre Trust has been given the chance to bring the venue back to life. Edinburgh Council has granted the Trust a five-year lease on the property and organisers have ambitious plans for the venue. Fundraising efforts begin on Saturday evening with a concert headlined by Leith musician Dean Owens. If all goes to plan, it is hoped the first phase of the restoration will be finished by autumn 2014.